The Android TV Input Framework (TIF) simplifies delivery of live content to Android TV. 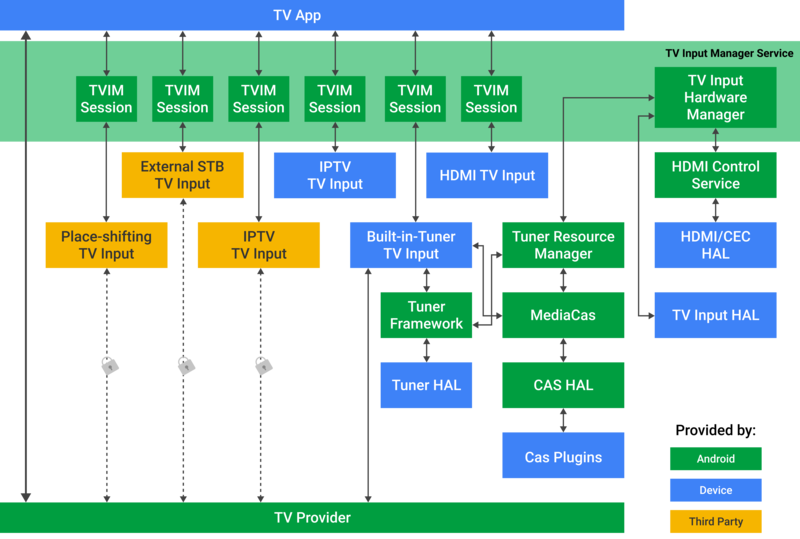 The Android TIF provides a standard API for manufacturers to create input modules for controlling Android TV, and enables live TV search and recommendations via metadata published by the TV Input. The framework does not seek to implement TV standards or regional requirements, but does make it easier for device manufacturers to meet regional digital TV broadcast standards without re-implementation. Documentation in this section might also be useful to third-party app developers who want to create custom TV Inputs. The Android TV Input Framework implementation includes a TV Input Manager. The TIF works with the TV App, a system app that can’t be replaced by a third-party app, to access built-in and IP tuner channels. The TV App communicates with TV Input modules supplied by the device manufacturer or other parties through the TV Input Manager. These components are covered in detail below. 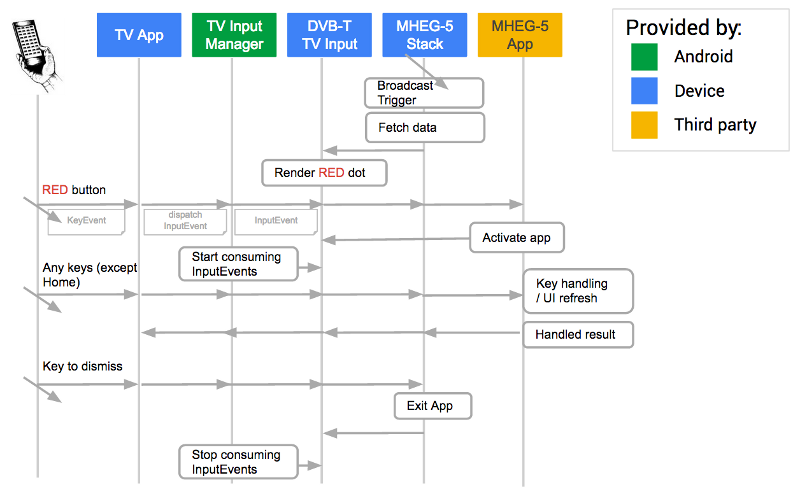 See the following diagram for a detailed view of the Android TV Input Framework architecture. The user sees and interacts with the TV App, a system app that can’t be replaced by a third-party app. The TV App displays the AV content from the TV Input. The TV App cannot talk directly with the TV Inputs. The TV Input Manager identifies the state of TV Inputs for the TV App. See TV Input Manager below for more details about these limitations. Only signatureOrSystem TV Inputs and TV App have full access to the TV Provider database and are able to receive KeyEvents. Only system TV Inputs can access the TV Input HAL through the TV Input Manager service. TV Inputs are accessed one-to-one via TV Input Manager sessions. Third-party TV Inputs have package-locked access to the TV Provider database and can READ/WRITE only to matching package rows. Third-party TV inputs can either display their own content or content from a device manufacturer’s passthrough TV inputs, like HDMI1. They can’t display content from non-passthrough TV inputs, like a built-in or IPTV tuner. TV_INPUT_HARDWARE permission for a hardware TV Input app, signals the TV Input Manager Service to notify the TV Input service on boot to call the TV Input Manager Service and add its TV Inputs. This permission allows a hardware TV Input app to support multiple TV Inputs per TV Input service, as well as being able to dynamically add and remove its supported TV Inputs. The TV Provider database stores the channels and programs from TV Inputs. The TV Provider also publishes and manages the associated permissions so that TV Inputs can see only their own records. For instance, a specific TV Input can see only the channels and programs it has supplied and is prohibited from accessing any other TV Inputs’ channels and programs. The TV Provider maps "broadcast genre" to "canonical genre" internally. TV Inputs are responsible for populating "broadcast genre" with the value in the underlying broadcast standard, and the "canonical genre" field will automatically be populated with the correct associated genre from android.provider.TvContract.Genres. For example, with broadcast standard ATSC A/65 and program with genre 0x25 (meaning “Sports”), the TV Input will populate the “broadcast genre” with the String “Sports” and TV Provider will populate the “canonical genre” field with the mapped value android.provider.TvContract.Genres.SPORTS. See the diagram below for a detailed view of the TV Provider. Only apps in the privileged system partition can read the entire TV Provider database. Passthrough TV inputs do not store channels and programs. In addition to the standard fields for channels and programs, the TV Provider database also offers a BLOB type field, COLUMN_INTERNAL_PROVIDER_DATA, in each table that TV Inputs may use to store arbitrary data. That BLOB data can include custom information, such as frequency of the associated tuner, and may be provided in a protocol buffer or another form. A Searchable field is available to make certain channels unavailable in search (such as to meet country-specific requirements for content protection). Display: Display fields contain information that apps may want to make visible to the user, like a channel’s name (COLUMN_DISPLAY_NAME) or number (COLUMN_DISPLAY_NUMBER), or the title of the program being viewed. Metadata: There are three fields for identifying content, according to relevant standards, like a channel’s transport stream ID (COLUMN_TRANSPORT_STREAM_ID), original network ID (COLUMN_ORIGINAL_NETWORK_ID) and service id (COLUMN_SERVICE_ID). Internal data: Fields that are for the custom use of TV Inputs. Some fields, like COLUMN_INTERNAL_PROVIDER_DATA, are customizable BLOB fields where a TV Input can store arbitrary metadata about their channel or program. Flag: Flag fields represent whether a channel should be restricted from search, browse, or viewing. This can be set only at the channel level. All programs defer to the setting on the channel. COLUMN_SEARCHABLE: Restricting search from some channels may be a requirement in certain regions. COLUMN_SEARCHABLE = 0 means the channel should not be exposed in search results. COLUMN_BROWSABLE: Visible to system applications only. Restricting channel from being browsed by applications. COLUMN_BROWSABLE = 0 means the channel should not be included in the channel list. COLUMN_LOCKED: Visible to system applications only. Restricting channel from being viewed by invalid accounts without entering PIN code. COLUMN_LOCKED = 1 means the channel should be protected by parental control. All fields are visible to anyone with access to the corresponding row. No fields are directly accessible to users; they see only what the TV App, System apps, or TV Inputs surface. Each row has PACKAGE_NAME, the package (app) that owns that row, checked on Query, Insert, Update via TvProvider.java. A TV Input may access only the information it wrote and is cordoned off from the information provided by other TV Inputs. 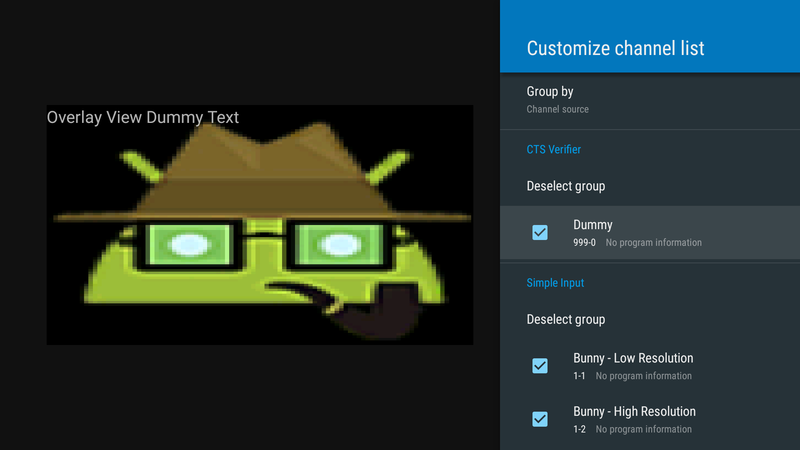 READ, WRITE permissions via AndroidManifest.xml (requires user consent) to determine available channels. Only signatureOrSystem apps can acquire ACCESS_ALL_EPG_DATA permission to access the entire database. For sessions, a TV Input may be tuned by the TV App only to URIs it has added to the TV Provider database, except for passthrough TV Inputs which can be tuned to using TvContract.buildChannelUriForPassthroughInput(). A TV Input may also have its volume set. TV Inputs provided and signed by the device manufacturer (signature apps) or other apps installed in the system partition will have access to the entire TV Provider database. This access can be used to construct apps to browse and search across all available TV channels and programs. An app may create and register a TvInputCallback with the android.media.tv.TvInputManager to be called back on a TV Input’s state change or on the addition or removal of a TV Input. For example, a TV App can react when a TV Input is disconnected by displaying it as disconnected and preventing its selection. The TV Input Manager abstracts communication between the TV App and TV Inputs. The standard interface of TV Input Manager and TV Input allows multiple device manufacturers to create their own TV Apps while helping all third-party TV Inputs work on all TV Apps. TV Inputs are Android apps in the sense they have an AndroidManifest.xml and are installed (via Play, pre-installed, or sideloaded). Android TV supports pre-installed system apps, apps signed by the device manufacturer and third-party TV Inputs. Some inputs, like the HDMI input or built-in tuner input, can be provided only by the manufacturer as they speak directly with the underlying hardware. Others, such as IPTV, place-shifting, and external STB, can be supplied by third parties as APKs on Google Play Store. Once downloaded and installed, the new input can be selected within the TV App. In this example, the TV Input provided by the device manufacturer is trusted and has full access to the TV Provider. As a passthrough TV Input, it does not register any channels or programs with the TV Provider. To obtain the URI used to reference the passthrough input, use the android.media.tv.TvContract utility method buildChannelUriForPassthroughInput(String inputId). The TV App communicates with the TV Input Manager to reach the HDMI TV Input. In this example, the Built-in Tuner TV Input provided by the device manufacturer is trusted and has full access to the TV Provider. In this example, the external STB TV Input is provided by a third party. Since that TV Input can’t directly access the HDMI video feed coming in, it must go through the TV Input Manager and use the HDMI TV Input provided by the device manufacture. Through the TV Input Manager, the external STB TV Input can speak with the HDMI TV Input and ask it to show the video on HDMI1. So the STB TV Input can control the TV while the manufacturer-provided HDMI TV Input renders the video. The diagram above shows how buttons on a remote control are passed to a specific TV Input for picture in picture (PIP) display. Those button presses are interpreted by the hardware driver supplied by the device manufacturer, converting hardware scancodes to Android keycodes and passing them to the standard Android input pipeline InputReader and InputDispatcher functions as KeyEvents. These in turn trigger events on the TV App if it is in focus. Only system TV Inputs are eligible to receive InputEvents, and only if they have the RECEIVE_INPUT_EVENT system permission. The TV Input is responsible to determine which InputEvents to consume and should allow the TV App to handle the keys it does not need to consume. The TV App is responsible for knowing which system TV Input is active, meaning selected by the user, and to disambiguate incoming KeyEvents and route them to the correct TV Input Manager session, calling dispatchInputEvent() to pass on the event to the associated TV Input. The following diagram shows a more detailed view of how KeyEvents are routed through the Android TIF. It depicts the flow of a Red button app, common in Europe for letting users access interactive apps on their televisions. An app can be delivered over this transport stream. When the button is clicked, it lets users interact with these broadcast apps. For example, you might use these broadcast apps to access related web pages or sports scores. See the Broadcast app section to learn how broadcast apps interact with the TV App. The TV App is in focus and receives all keys. KeyEvents (e.g. the Red button) is passed to the active TV Input as InputEvents. The system TV Input integrates with MHEG-5 stack and has the RECEIVE_INPUT_EVENT system permission. On receiving activation keycode (e.g. Red button), the TV Input activates broadcast app. TV input consumes KeyEvents as InputEvents and the broadcast app is the focus and handles InputEvents until dismissed. Note: Third-party TV inputs never receive keys. 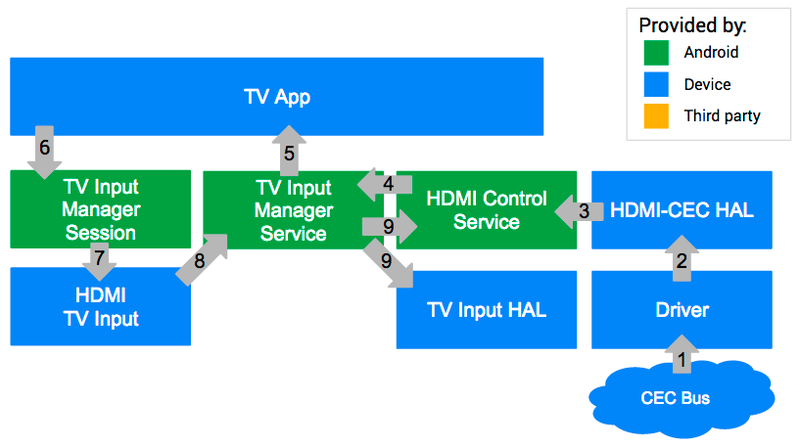 The TV Input HAL aids development of TV Inputs to access TV-specific hardware. As with other Android HALs, the TV Input HAL (tv_input) is available in the AOSP source tree and the vendor develops its implementation. The system TV App presents live TV content to the user. A reference TV App (Live TV) is provided alongside the Android platform, which can be used as-is, customized, extended, or replaced by device manufacturers. The source code is available in the Android Open Source Project, and you can get started with it in the Reference TV app article. Device manufacturers may extend their TV Apps to implement device manufacturer or country-specific features, however this is not in the scope of TIF or the reference TV App. This feature set will increase in line with new Android versions where the platform TIF APIs are extended. CTS Verifier provides the compatibility test coverage. 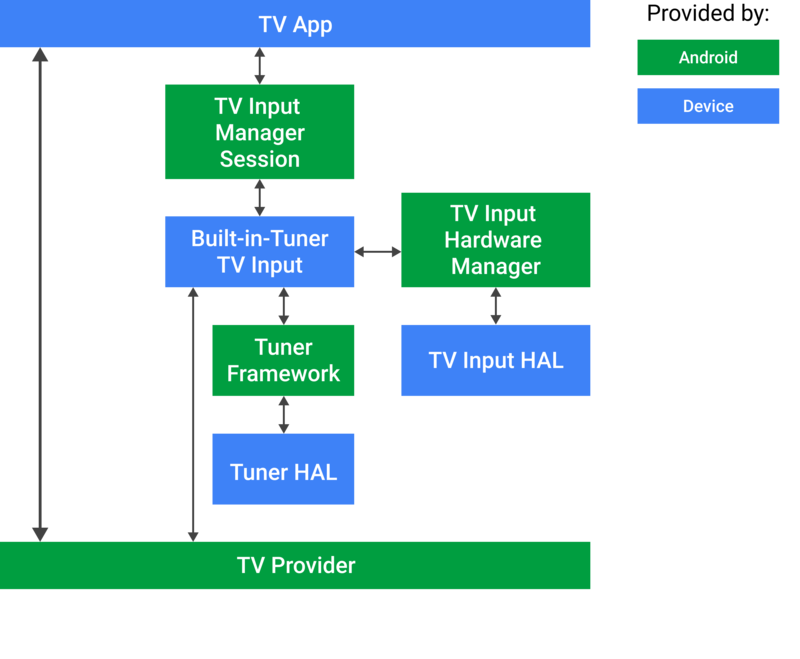 Android TV provides developer APIs for third-party TV inputs, enabling installed apps to deliver software channels into the live TV experience. To ensure a compatible Android device implementation, the system TV App has some responsibilities regarding surfacing third-party TV inputs and channels to the user. The reference Live TV app provides a compatible implementation; if replacing the system TV App, device manufacturers must ensure their own apps provide similar compatibility, to meet developer expectations across all Android TV devices. 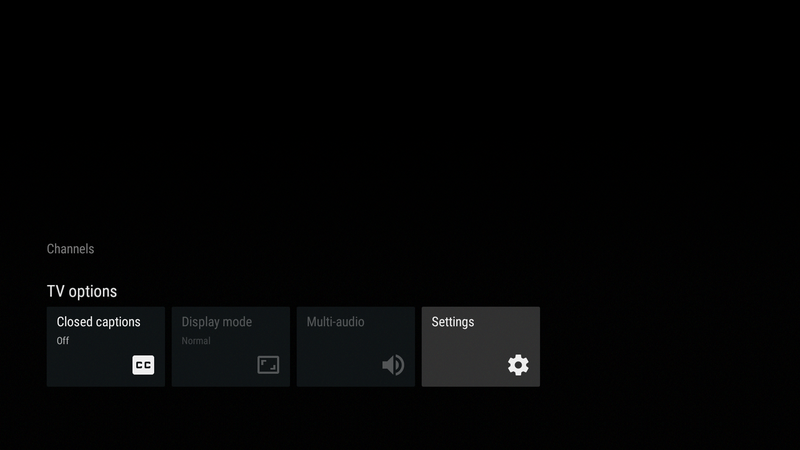 The system TV App must surface third-party inputs alongside the device's default live TV service. The promise of the developer APIs is that users will be able to find channels (once installed) within their standard TV experience. Visual differentiation between built-in channels and third-party channels is allowed, as defined in the TV App section of the Android CDD. The following sections show how the Live TV application fulfills the CDD requirements. 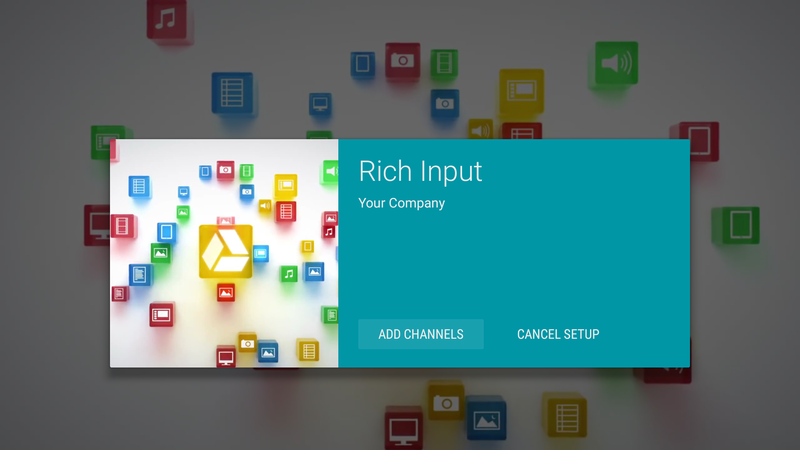 The addition of new third-party inputs/channels begins with the user finding and installing a TV Input from an application store, such as Google Play. Some third-party TV inputs automatically add channels to the TvProvider database. However most will provide a Setup activity to enable the user to set up their channels, provide login details, and other actions. The system TV App needs to ensure the user can activate this Setup activity, which is why the CDD requires third-party inputs be minimal navigation actions away from the main TV App. The reference Live TV app provides the Channel Sources menu for accessing inputs. Figure 8. Go to Settings. Figure 9. Go to Channel sources in Settings. Figure 10. Select your source from the list. Figure 11. Add channels from your source. Figure 12. 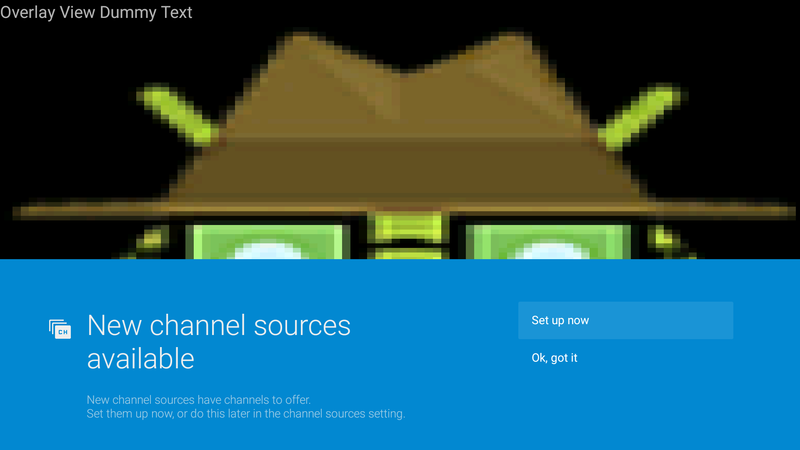 Notification that shows new channel sources are available. If the user takes action through the notification, they can select to set up their sources as seen in Figure 10. See Define Your TV Input Service for developer expectations in this area. Device manufacturers may provide a UI to hide certain channels and enable users to manage their own EPGs. Live TV includes this facility. Figure 13. Open the channel list in Settings. Figure 14. Customize your channel list. Third-party input developers need to have confidence that users can easily navigate to their channels during general usage, across all compatible Android TV devices. Channels from third-party inputs must be presented as part of the device's standard live TV experience EPG. 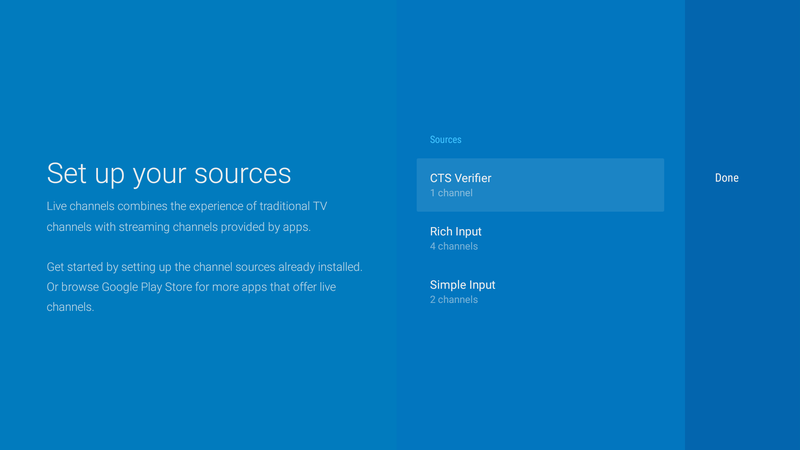 Visual separation or separate categories for third-party channels can be used (see the TV App section of the Android CDD) —what's key is that users are able to find the channels they have installed. Manufacturers must implement the TV App to include search results for global search requests in order to ensure the best user experience. Live TV provides an implementation (see com.android.tv.search.TvProviderSearch) which provides results from third-party inputs (required for platform compatibility) as well as built-in inputs. For devices on Android 6.0 and above, the TV App must support the Android framework time shifting APIs. Additionally, manufacturers must implement playback controls in the TV App, which allow users to pause, resume, rewind, and fast forward the playback. 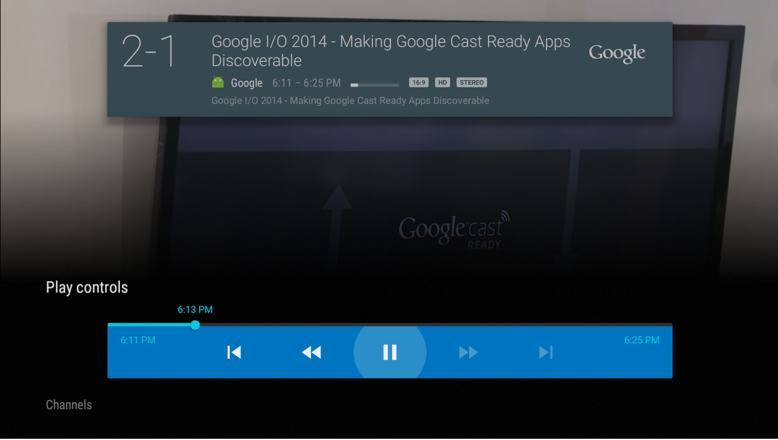 For TV Inputs that support time shifting, the TV App needs to display playback controls. For devices on Android 7.0 and above, the TV App must support the Android framework TV recording APIs, to support, list, and play recorded programs. This allows device manufacturers to plug their DVR subsystems into TIF and dramatically reduce the integration effort it takes to enable or integrate DVR functionality on a TV device. It also enables third parties to provide aftermarket DVR systems that can be plugged into an Android TV device. In addition to recording live content, the TV App also handles resource conflict. For example, if the device has two tuners, it can record two programs at the same time. If the user asks to record three, the TV App must handle the conflict and should either surface a notification or request that the user schedules a priority for these requests. TV Apps can also implement more sophisticated logic like asking a user if they’d like to record all future episodes in a series when they request to record one episode. See the following diagram for a view into a possible DVR implementation in Android TV. The TV Input Service tells the TV App how many tuners are available so that the TV App can handle possible resource conflict. The TV App receives a user-initiated request to record a TV program. The TV App stores the recording schedule in its internal database. When it’s time to record, the TV App passes a request to tune to the channel associated with the recording. The TV Input Service receives this request, responds with whether or not there are appropriate resources, and tunes to the channel. Then the TV App passes a request to start recording to the TV Input Manager. The TV Input Service receives this request and starts recording. The TV Input Service stores the actual video data in its storage, which can be external storage or cloud storage. When it's time to finish the recording, the TV App passes the stop recording request to the TV Input Manager. Once the TV Input Service receives the request, it stops the recording and adds its associated metadata to the TV Provider so that the TV App can show the recording to users when requested. For more information about implementing Recording features in your TV Input service, see this TV Recording article. The Android CDD and documented developer APIs are the definitive references. CTS Verifier exercises the APIs as part of the compatibility testing program. Running this against Live TV may be a useful way to see the EPG, Search, Parental Control, and other requirements in the context of third-party inputs. Parental control lets a user block undesired channels and programs, but bypass the block by entering a PIN code. Responsibility for parental control functionality is shared amongst the TV App, TV Input Manager service, TV Provider, and TV Input. Parental control is mandatory, and is covered by CTS Verifier. A number of countries have defined rating systems that TV Inputs can use via the TVContentRating API. Additionally, TV Inputs can register their own custom rating systems as demonstrated by the CTS Verifier test, which introduces a 'fake' rating. For countries where a standard rating system exists, device manufacturers are encouraged to combine the TV Input Framework Parental Control with any other mechanisms they may include. Each channel row has a COLUMN_LOCKED field that is used to lock specific channels from viewing without entering a PIN code. The program field COLUMN_CONTENT_RATING is intended for display and is not used to enforce parental control. The TV Input Manager stores every blocked TvContentRating and responds to isRatingBlocked() to advise if content with the given rating should be blocked. The TV Input checks if the current content should be blocked by calling isRatingBlocked() on the TV Input Manager when the rating of the displayed content has changed (on program or channel change), or parental control settings have changed (on ACTION_BLOCKED_RATINGS_CHANGED and ACTION_PARENTAL_CONTROLS_ENABLED_CHANGED). If the content should be blocked, the TV Input disables the audio and video and notifies the TV app that the current content is blocked by calling notifyContentBlocked(TvContentRating). If the content should not be blocked, the TV Input enables audio and video and notifies the TV App the current content is allowed by calling notifyContentAllowed(). To honor the parental control APIs, and therefore create a compatible platform, the system TV App needs to provide a way for users to manage parental control, including for any custom ratings registered by specific apps. The TV App shows a PIN code UI when it is notified by a TV Input that the current content is blocked or when the user attempts to view a blocked channel. The TV App does not directly store the parental control settings. When the user changes the parental control settings, every blocked TvContentRating is stored by the TV Input Manager, and blocked channels are stored by the TV Provider. The TV App needs to declare the permission android.permission.MODIFY_PARENTAL_CONTROLS in order to change the parental control settings. Exercise the CTS Verifier parental controls test against the reference Live TV application for a demonstration of the compatibility requirements. Use the Live TV app as reference for their own TV App: in particular see the ContentRatingsManager and RatingSystemsFragment source, and how they handle custom ratings. HDMI-CEC allows one device to control another, thereby enabling a single remote to control multiple appliances in a home theater. It is used by Android TV to speed setup and allow distant control over various TV Inputs via the central TV App. For instance, it may switch inputs, power up or down devices, and more. The Android TIF implements HDMI-CEC as the HDMI Control Service so that device manufacturers merely need to develop low-level drivers that interact with the lightweight Android TV HAL, skipping more complex business logic. In providing a standard implementation, Android seeks to mitigate compatibility issues by reducing fragmented implementations and selective feature support. The HDMI Control Service uses the existing Android services, including input and power. This means existing HDMI-CEC implementations will need to be redesigned to interoperate with the Android TIF. We recommend the hardware platform contain a microprocessor to receive CEC power on and other commands. The CEC bus receives a command from the currently active source to switch to a different source. The driver passes the command to the HDMI-CEC HAL. The HAL notifies all ActiveSourceChangeListeners. THe HDMI Control Service is notified of source change via ActiveSourceChangeListener. The TV Input Manager service generates an intent for the TV App to switch the source. The TV App then creates a TV Input Manager Session for the TV Input being switched to and calls setMain on that session. The TV Input Manager Session passes this information on to the HDMI TV Input. The HDMI TV input requests to set sideband surface. The TV Input Manager Service generates a corresponding routing control command back to HDMI Control Service when the surface is set. 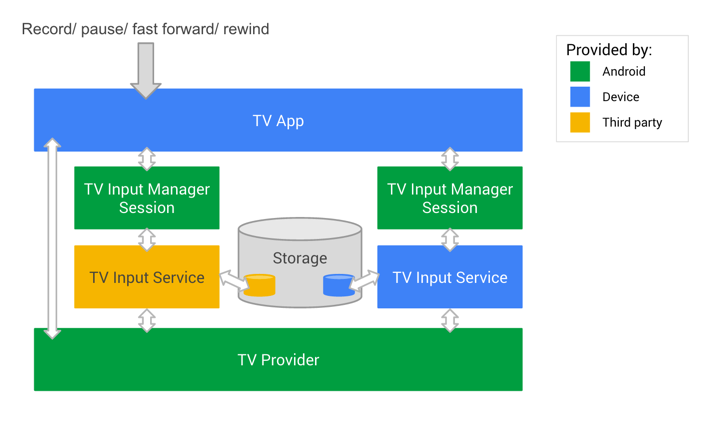 In the Android L release, Android TV expects device manufacturers to use systems integrators or the Android solutions for regional TV stacks, pass the surface to TV software stacks, or pass the necessary key code to interact with legacy stacks. The TV App is in focus, receiving all keys. The TV App passes keys (e.g. Red button) to the TV Input device. The TV Input device internally integrates with legacy TV stack. On receiving an activation keycode (e.g. Red button), the TV Input device activates broadcast apps. A broadcast app takes focus in the TV App and handles user actions. For voice search/recommendation, the broadcast app may support In-app search for voice search.